6.8 Earthquake hits the Samoa Islands. 5.8 Earthquake hits the Sandwich Islands. 5.7 Earthquake hits the Sandwich Islands. 5.1 Earthquake hits the Sandwich Islands. 5.1 Earthquake hits the Caucasus, Russia. 5.0 Earthquake hits the Sandwich Islands. Tropical storm Douglas forms and is located about 490 mi (790 km) SSW of the southern tip of Baja California. Tropical disturbance 91L is growing more organized – Will Bring Heavy Rains to Florida and the Bahamas. An area of disturbed weather over the warm waters of the Gulf Stream, about 230 miles east of Jacksonville, Florida (Invest 91L) has grown more organized since Saturday, and is a threat to develop into a tropical depression early this week. Regardless of the exact track of 91L, the coast of Central Florida and the Northwest Bahamas are likely to receive heavy rains of at least 2 – 4″ on Monday and Tuesday from 91L. If 91L develops into a tropical depression or tropical storm, widespread rainfall amounts of 4 – 8″ will likely fall in coastal Central Florida and the Northwest Bahamas. China – Rain hits south China, while heat scorches north – Heavy rain swept south China and will continue for the next few days, while heat waves scorched the northern regions, the National Meteorological Centre said Saturday. Yunnan, Sichuan, Jiangxi and Zhejiang provinces and Guangxi Zhuang Autonomous Region in southern China have experienced heavy downpour since June 17. Two people were killed in rainstorms in Yunnan on Saturday, with houses being submerged and bridges collapsed. Heavy rain also triggered landslides and flash floods in some areas. Rain will continue in Yunnan and Jiangxi, according to the weather observatory. Meanwhile, a heat wave has scorched northern China. Temperatures climbed above 36 degrees Celsius in Beijing and some parts of neighbouring Hebei Province. Beijing issued yellow warning for high temperature for Saturday and Sunday. China has a four-colour-coded warning system for severe weather, with red being the most serious, followed by orange, yellow and blue. Canada – Flash floods lead to states of emergency in southeast Saskatchewan. The cities of Melville and Yorkton in Saskatchewan declared states of emergency Sunday due to heavy rainfall that flooded streets and overwhelmed sewer and drainage systems. Environment Canada has issued rainfall warnings for a big stretch of southern Saskatchewan and Manitoba, including the cities of Regina and Brandon, Man. As much as 125 to 150 millimetres of rain fell throughout the weekend. Kansas, USA – A severe storm damaged parts of western Kansas overnight, bringing a tornado, strong winds and heavy rains. The small tornado touched down about 12 miles south of Gove around 5 a.m. Sunday, damaging three buildings on a farm. Brazil – Severe flooding caused by a week of torrential rain in southern Brazil has forced more than 50,000 people from their homes, officials said Sunday, increasing an earlier estimate almost tenfold. The emergency agency for Santa Catarina state said 40,000 people had been forced to leave their homes, while neighboring Rio Grande do Sul said 10,700 people had evacuated, revising earlier estimates as the extent of the damage became clear. On Saturday, the two states had reported a combined total of 6,000 evacuees. Images of the affected areas showed entire neighborhoods with houses covered in water up to their roofs. The floods have hit 37 towns in Santa Catarina and 59 in Rio Grande do Sul, officials said. Rio Grande do Sul reported that more than twice the average rainfall for June in the state from Monday to Friday alone. The rains continued over the weekend, though they let up slightly Sunday afternoon. The southern state of Parana was also hit by heavy rains this month, causing floods that killed 11 people and affected more than 700,000. The flooding comes as Brazil hosts the World Cup round of 16. Porto Alegre, the capital of Rio Grande do Sul, hosts the knockout match between Germany and Algeria on Monday, but has not been hit by the recent floods. Beijing saw an outbreak of hand-foot-mouth disease with more than 2,600 cases reported per week from May 26 to June 22, said the capital’s disease prevention center on Sunday. In the four consecutive weeks during the period, the number of weekly reported hand-foot-mouth cases increased from 2,645 to 3,013 in Beijing, said the Beijing Disease Prevention and Control Center. The cases were more than the same period last year, but the critical or death cases were almost the same, said the municipal health authorities. Hand-foot-mouth disease is a viral illness that usually affects infants and children younger than five years old. The disease starts with a slight fever followed by blisters and ulcers in the mouth and rashes on the hands and feet. The virus is usually transmitted through digestive and respiratory systems or through intimate contact. Crews making progress against Arizona wildfire – Crews battling a wildfire in Arizona’s eastern mountains are making headway with successful burnout operations, even as the blaze blackens more territory. Stromboli (Eolian Islands, Italy): Activity at the volcano increased further and produced several lava overflows both inside the crater and on the upper Sciara del Fuoco. At the moment, the latter one is still active and has a length of approx. 200 m. Following intense phases of continuous spattering (or small lava fountaining) from the cntral and other vents, accompanied by increasing tremor, a first intra-crater lava flow started around 08:30 local time from the NE hornito (S2). Shortly after, starting from 11:18 an effusive vent starts to open up on the outer northwestern slope of the crater terrace, some ten meters beneath the NW vent complex (vent S3), and issue a lava flow directly onto the Sciara. Both lava flows were relatively short-lived, while strombolian and spattering activity continued intense at the various vents. 6.2 Earthquake hits the Volcano Islands off Japan. 5.2 Earthquake hits Arizona, USA. Arizona – A wildfire that has charred nearly 8 square miles in eastern Arizona’s White Mountains held steady Saturday, though the human-caused blaze has not been brought under control at all, officials said. Communities mostly populated with summer homes remained under mandatory evacuation orders because of the fire about 135 miles east of Phoenix, near the New Mexico line, which was reported around noon Thursday. There have been no reported injuries, and no new evacuations or notices to be ready to flee have been issued. Nine Hotshot crews, 12 engines, five heavy air tankers and a helicopter were fighting the fire on part of the Fort Apache Indian Reservation and in the national forest. Tropical depression 4-E is moving quickly west-northwestward away from Mexico. A area of disturbed weather over the warm waters of the Gulf Stream current off the Southeast U.S. coast has been designated Invest 91L. Satellite loops on Saturday morning showed 91L with only a small amount of heavy thunderstorm activity that was poorly organized. There was no hint of a surface circulation trying to form. West Africa’s first-ever Ebola outbreak in humans is now the most deadly and geographically widespread outbreak on record and is threatening to spread, health officials say. According to the latest figures from the World Health Organization (WHO), there have been more than 635 cases of Ebola across three countries in the region since the outbreak was first declared in southeastern Guinea in March. It has since spread to Liberia and Sierra Leone. At least 400 people have died. The virus, one of the world’s most virulent, is transmitted by contact with the blood, fluids or tissues of infected animals or people. It causes high fever, vomiting, muscle pain and diarrhea, and can result in unstoppable internal bleeding and organ failure. Transmission risk is especially high among doctors, nurses and other health care workers. There is no vaccine for it, nor any known cure. Stromboli (Eolian Islands, Italy): Activity remains elevated. A high level of magma causes continuous spattering and many strombolian eruptions from several vents on the crater terrace. Frequent rockfalls are occurring on the Sciara del Fuoco, but (so far at least) no new lava overflows. Sakurajima (Kyushu, Japan): A stronger phase of activity is occurring at the volcano. During the past 24 hours, 4 vulcanian-type explosions were registered, ejecting ash plumes to up to 13,000 ft (4.2 km) altitude. In addition, the volcano has continuous phases of ash emissions following the explosions. Ash plumes, some of them relatively thick have been drifting S, SE and E. Compared to last year, the volcano has been less active, however. So far, there have been approx. 240 recorded eruptions (explosions), while this number last year at the same time was already almost double (435). Kilauea (Hawai’i): A new lava breakout occurred Friday early morning (local time) from a new vent on the outer northern flank of Pu’u ‘O’o crater. It feeds a new lava flow with several branches headed to the north and northeast. The most advanced of the them traveled to the NW and had quickly reached a length of approx 1 km yesterday, but has not advanced much since. The event was marked by a sudden deflation of the cone, indicating that magma drained from underneath the Pu’u ‘O’o crater terrace and moved to the new vent. This rapid drop in magma level under the crater terrace resulted in the collapse of several of the spatter cones. Until yesterday, these had been the site of frequent overflows and were feeding the Kahaual’a2 flow field. Overall, activity at the volcano has been relatively stable over the past months, with good magma supply to both the summit lava lake in Halema’uma’u and the Pu’u ‘O’o vents on the eastern rift zone in 10 km distance. The new vent at Pu’u ‘O’o is simply a change in the surface configuration of vents for Kilauea’s continued magma supply. 5.4 Earthquake hits the Bonin Islands off Japan. Serbia – Extreme weather is continuing in Serbia this summer, with a new round of storms hitting many areas of the country late on Wednesday. A tornado-like storm was reported in a village near the town of Lazarevac. Strong winds in Šopići ripped off roofs from homes, caused significant damage to a local church, and turned over vehicles, including a tank truck. Heavy rain and high winds affected several other towns, including Topola and Aranđelovac in central Serbia, Šabac, Bogatić, and Koceljeva in the west, and Belgrade. 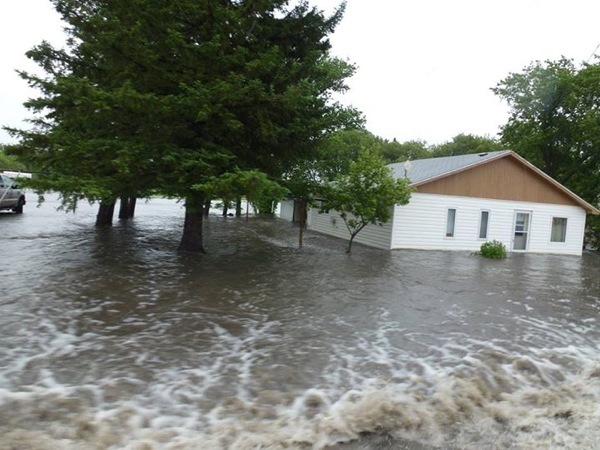 USA – Heavy rains over the past couple of weeks have rivers rising all across the Upper Midwest, flooding homes, swamping fields and washing out roads. 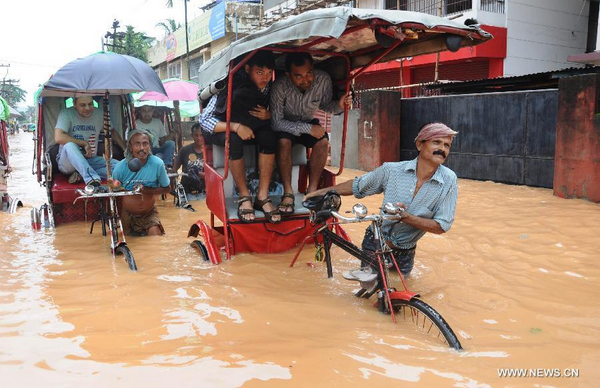 India – Landslides and floods in Guwahati today have claimed the lives of at least nine people. Around 154 flood relief camps have been opened across Assam, where nearly 2 lakh people have taken shelter. The floods are the worst in Assam since 1998. Paraguay – Floods caused by torrential rains have forced the evacuation of 200,000 people living near the Paraguay and Parana Rivers. On 22-23 and 25 April 2014, Taipei Centers for Disease Control (CDC) reported 2 additional laboratory-confirmed cases of human infection with avian influenza A(H7N9). These are the third and fourth cases with infection of avian influenza A(H7N9) virus reported from Taipei CDC. The Huron County Health Unit is advising people to be aware of an outbreak of Hand, Foot and Mouth Disease. The virus spreads very quickly and often in schools and day care centres, although adults can get it as well. Symptoms can include a fever and general tired or run down feeling as well as blisters inside of the mouth and on the hands and feet. The symptoms don’t usually last for more than a few days, but the virus is very contagious, particularly in the first week when symptoms are often not evident. The Hand, Foot and Mouth virus commonly shows up in the late spring or early summer and she says the best prevention is frequent hand washing. San Miguel volcano (El Salvador) activity update The volcano continues to be in an unstable phase. Tremor remains elevated, but has dropped significantly during the past days. Fuego volcano (Guatemala) activity update Activity has been relatively low recently. The volcano observatory only reported weak to moderate explosions with ash plumes up to 500 m height above the crater. Dukono volcano (Halmahera, Indonesia) activity update Explosive activity at the volcano continues at elevated levels. Ash-rich strombolian explosions produce a plume that rises 1-2 km above the crater sometimes extends up to approx. 100 km and is often visible on satellite imagery. On 3 June 2014, the National IHR Focal Point of Saudi Arabia reported 113 laboratory-confirmed cases of infection with Middle East respiratory syndrome coronavirus (MERS-CoV), including 34 deaths. These cases and deaths were identified through retrospective review of hospital records, dating between 5 May 2013 and 6 May 2014. The majority of the cases (84) occurred after 1 March 2014; and the rest of cases (29) occurred between 5 May 2013 and 28 February 2014. On 19, 20, 22 and 23 June 2014, National IHR Focal Point of Saudi Arabia notified WHO of 4 additional laboratory-confirmed cases of infection with Middle East respiratory syndrome coronavirus (MERS-CoV).